The crypto-utils package provides a set of utilities to generate and manage SSL certificates and private keys. Among these utilities is genkey. 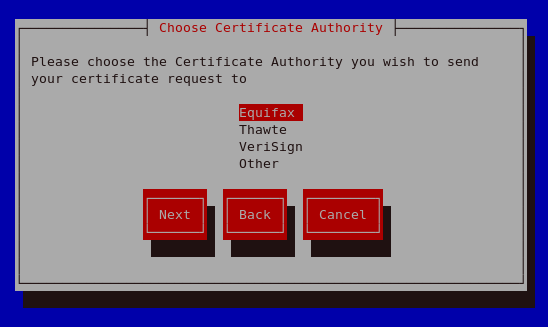 Alternatively, you can create your own self-signed certificate. Note, however, that self-signed certificates should not be used in most production environments. 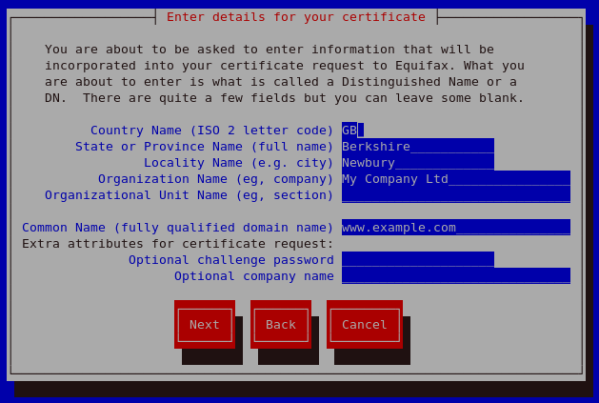 Self-signed certificates are not automatically accepted by a user's browser — users are prompted by the browser to accept the certificate and create the secure connection. Refer to Section 21.8.4, “Types of Certificates" for more information on the differences between self-signed and CA-signed certificates. 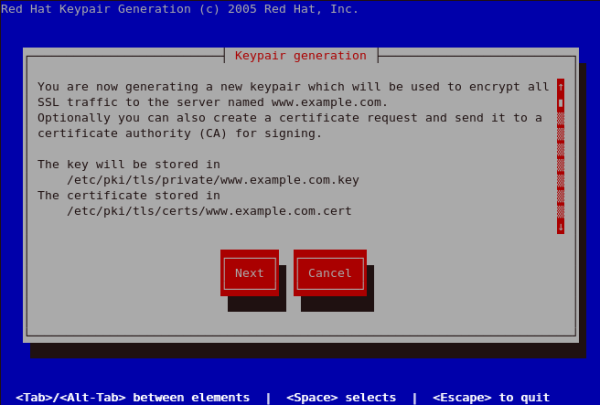 Whether you are getting a certificate from a CA or generating your own self-signed certificate, the first step is to generate a key. Refer to Section 21.8.5, “Generating a Key" for instructions. 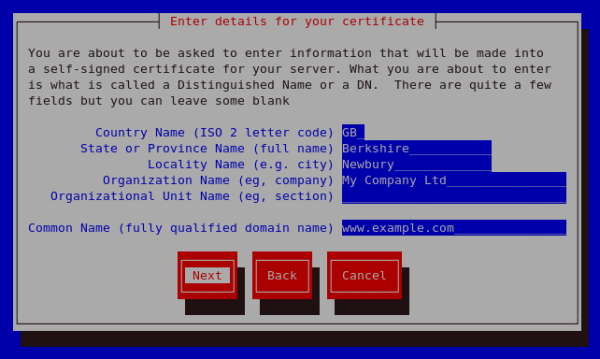 Selecting Yes will prompt you to select the Certificate Authority you wish to send your request to. Selecting No will allow you to generate a self-signed certificate. The next step for this is illustrated in Figure 21.17, “Generating a self signed certificate for your server". 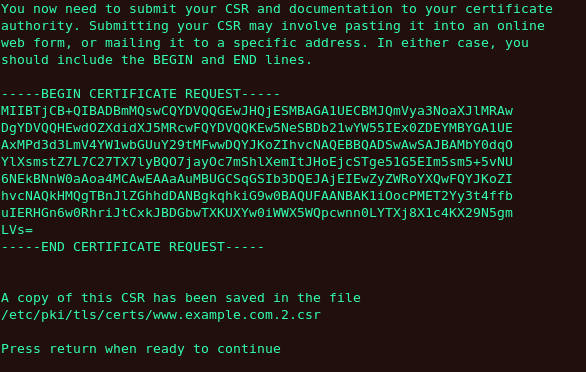 If you prefer to generate a self signed cert key pair, you should not generate a CSR. 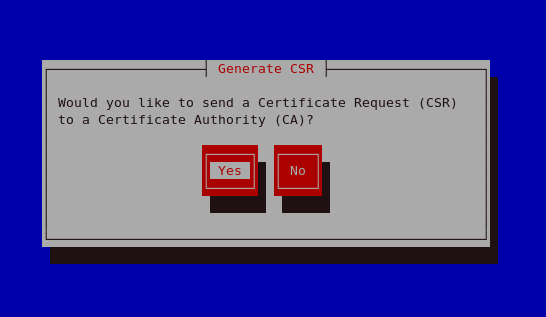 To do this, select No as your preferred option in the Generate CSR screen. This will display the figure below from which you can enter your certificate details. 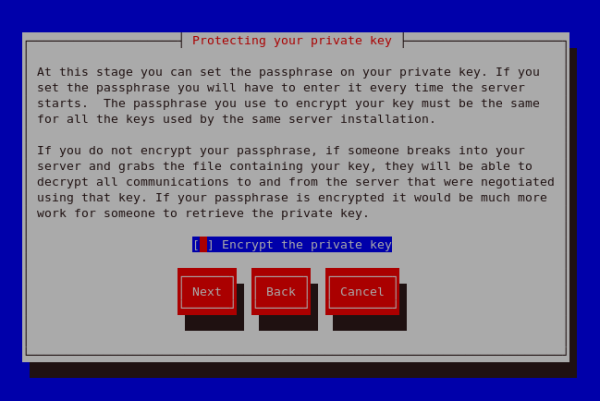 Entering your certificate details and pressing the return key will display the Figure 21.19, “Protecting your private key" from which you can choose to encrypt your private key or not. The next screen allows you to set your key passphase. Please do not lose this pass phase as you will not be able to run the server without it. You will need to regenerate a new private or public key pair and request a new certificate from your CA as indicated. 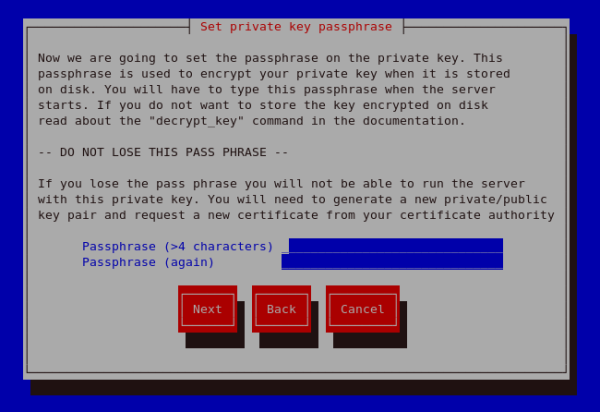 For security, the passphase is not displayed as you type. On typing your preferred passphase, select Next to go back to your terminal. 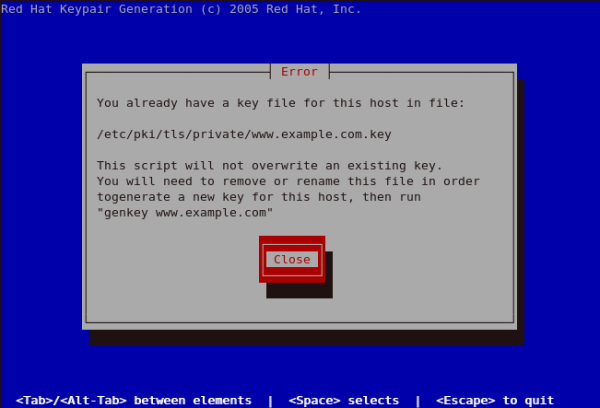 If you attempt to run genkey makeca on a server that has an existing key pair, an error message will be displayed as illustrated below. 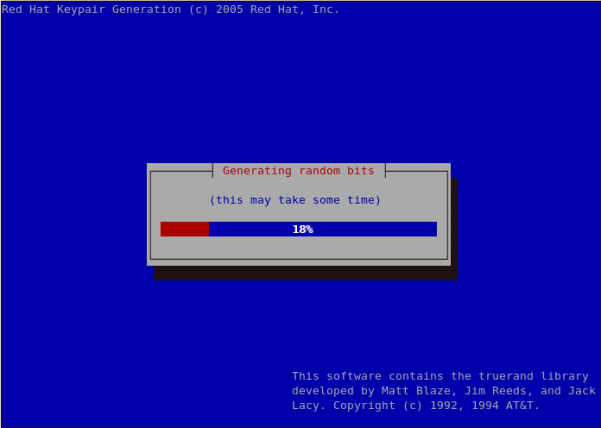 You need to delete your existing key file as indicated to generate a new key pair. where the "www.example.com" part should match the argument passed on the genkey command.